If you're the regular reader of SolveMyHow then you might have noticed that this is the backlinks season going on here. Since last couple of days I'm just posting about SEO link building strategies just to explain you the importance of dofollow backlinks in blogging world. After you create a website / blog, you just wanted to improve your search engine ranking any how right ? But for that your just need to concentrate on your blog's SEO search engine optimization and secondly you need to get spam free dofollow backlinks from high PR sites say PR9 backlinks. For now lets keep this post straight and upto the point. Every known blogger have heavy presence on YouTube because its not just the PR9 site but also the world's leading video website with the Alexa rank 3. So, getting backlinks either NoFollow and DoFollow will definitely increase your website's traffic. Certainly the backlinks you obtain from YouTube are definitely nofollow. Which means this doesn't count by Google and no link juice is passed to Google. So, this won't improve your SERP's but nofollow backlinks are also important when it is coming from YouTube. The links obtained from about me section, description and share box are nofollow backlinks. Step 1 :- Sign Up for YouTube account. Well its good if you already have an account. So, simply log in with the same Gmail account you're using. Step 2 :- Verify your blog with Google Webmaster Tools. The blog you wanted to link with YouTube must be verified with Google Webmaster Tools. So, simply log in into Google Webmasters and add your blog. Step 4 :- Go to Channels >> Advanced. Now navigate to "Associated website" and enter your blog's URL and click on verify. Step 5 :- Verification Successful. If your blog is already verified with the Google Webmaster Tools then it will give you successful verification message else it will ask you to verify your site with Google webmasters. That's it. 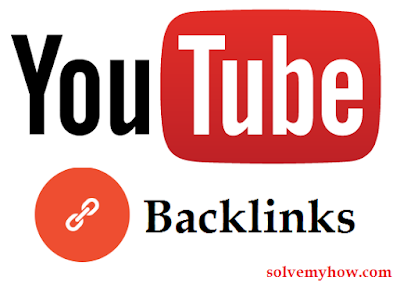 You have just got a DoFollow backlink from YouTube. So, this was all about getting DoFollow YouTube Backlinks. Hope you found this article worth reading and helpful. Do me a favour please share this article with your Google plus and Twitter Friends. So, they can also get backlinks from YouTube. Do let me know if you're facing any problem in creating backlinks from YouTube in the comments below. You can also Subscribe for SolveMyHow Newsletter to get Backlinks, SEO, Blogging and Hacking tips right into your INBOX !